Did You Know? Drain-O, or any other clog busting chemical, eventually eat away at your rubber seals. I have personally used this tip in the past for clogged drains - and it really did work! 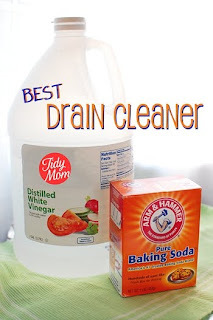 I would pour a 1/2 to 1 cup of baking soda into the clogged drain, then pour in 1/2 cup of vinegar. I would let it sit for about 20-30 minutes. Then I would dump a pot filled with boiling water - and the drain would clear immediately! Amy Shifton posted: This is also a way to clean your washer and dishwasher. Keith Stevens posted: Works on some clogs for me. Nicole Krause posted: I just used this on Saturday. My husband thought I was nuts when I was doing it but was impressed when it worked. Bev Krake posted: Yes, I have tried this many times, but still doesn't quite work sometimes. How I would like it to work vs Draino, but it does seem to have somewhat of an effect for the most part. Jennifer Cooper posted: This didn't work for me. Karolyn Kostlivy posted: Been using this for years... someone told me about it when I moved into my apartment, uhmmm.... over 15 years ago... once a week I do it in my kitchen sink, and have never ever had a blocked pipe! Heather Minnich posted: On the advice of a plumber after the disastrous use of Liquid Plumber on very old pipes, I use Clorox to clear minor clogs. Sarah Bentley Haiar posted: It also works to soak in your bathtub as a cleaning agent for those of us with ceramic tubs. Roberta Dias posted: Heloise has given this tip many times, and it is very effective, not to mention safe and costs pennies. Regina Vaughn posted: Thanks - now you really enlightened me about that.....environmentally safe ......really did not know you could unplug the drain like that. Good tip!